Establishing a camp at Burning Man is difficult in itself. Planning the energy needs for a camp is one of the last things on most people's minds. Energy planning is often treated as a task as simple as selecting a tent — usually one person will say, "I have a generator," and people will bring all the decorative lighting they have along with some modest sound system, and of course a bunch of gasoline. A more practical solution would be to deliberately plan the energy needs of the camp, starting with the desires of powered equipment and working back through converters and generators to arrive at the equipment and fuel needed. Most of all, though, the process needs to lean as far towards fun and as far away from "arduous" to encourage people to actually do it. It should also be educational, offering insight into what energy is and how much we use. There is another subtlety to planning: the difference between energy and power. More power means more work done in the same amount of time. More energy means the same power for a longer time. 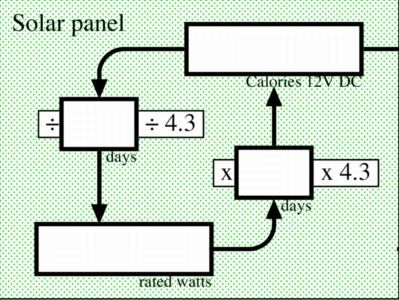 With 100 watt-hours of energy, one can power a 5-watt lamp for 20 hours (5 x 20 = 100) or a 100-watt lamp for 1 hour (100 x 1 = 100). More importantly, though, many devices that convert energy from one form to another have a power limit. For instance, a generator with 1000-watt capacity can't run a 900-watt coffee maker and a 1000-watt sound system although each can be run separately. In the end, running the coffee maker for 20 minutes and the sound system for 20 minutes results in the same amount of energy whether it's 1900 watts for 20 minutes or 900 watts for 20 minutes and 1000 watts for 20 minutes. There is also some blog entries on this project. Fuel– Fuel is consumed to release its energy. It includes things like food, battery charge, disposable batteries, and gasoline. Rechargeable– A rechargeable is something that can be replentished with energy from some source. 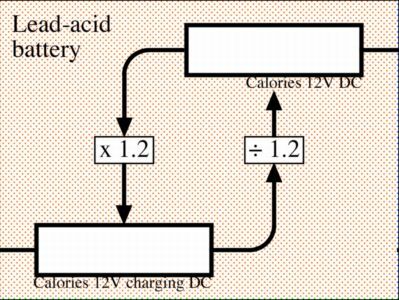 Typically it would be a rechargeable battery, but a hydrogen or methane tank, or a flywheel is also possible. Converter– A converter takes energy in one form and makes it another with some amount of loss in the process. A generator is a converter that takes gasoline (typically) as input and produces AC electricity. Producer– A producer "creates" energy. A solar panel or windmill are examples of producers. Consumer – A consumer "consumes" energy. An amplifier or firepit consumes energy. The layout of the cards shall have the name of the device is in the upper-left corner, the output energy is in the upper-right, and the input energy is in the lower-left. 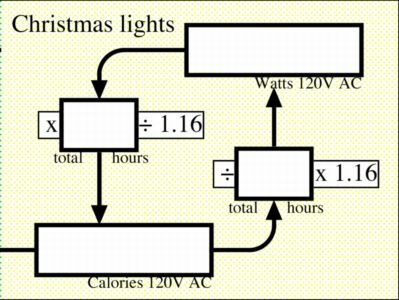 That way, if, say, you have a bunch of lights, you can stack the cards to show only the energy input, or the reverse for energy output. The example cards are shown below, but I originally created them as a PDF file here. The idea is that you start with your consumers — the devices you'll need in your camp. Print as many cards as you need and write in the values as appropriate. Then work right-to-left and try using a generator, for instance, and connect that card to the left. Likewise, connect the gasoline fuel card to the left of the generator and figure out how many gallons of gas you'll need.